Jack (left) and Jim Harnwell holding up the airborne kamikaze mack that decided to shake things up for all aboard. NT Report: Flying macs & guns of steel! ON Tuesday of this week I had the pleasure of having mate and Fisho publisher Jim Harnwell and his son Jack aboard Barraddiction for a day trip to the Vernon Islands, which are located around 40km by sea north-east of Darwin. Due to several severe late afternoon storms over Darwin and the Tiwi Islands, their Monday evening flight back from the Melville Island Lodge was rightly cancelled. As a result they flew in on Tuesday morning which meant a delayed launch time for us of 10:00 hours. But with good weather conditions and a flat sea our day ahead was as bright as the big sun overhead. Not the earliest of morning launches but with a flat sea and a blue sky it's high time to get out wide and chase some fish. Our game plan for the day was pretty simple and involved vertically jigging for macs, GTs and queenies around the islands. Once we arrived at our first spot it didn't take too long before the sounder was showing plenty of fish milling around. However, my usual jigging motto of "If I can find 'em I can catch 'em" was not ringing true as our various jig offerings were ignored. In such situations the first thing to do is to lose the wire traces and run your mono leader straight to the jig itself. As the saying goes it's better to have loved and lost than have never loved at all. In a similar vein I'd rather be snipped off by a mac than have never hooked one at all. Anyway even without wire, eliciting a strike from these shut down fish was proving hard, but over the next hour we hooked four decent Spaniards but all cut our leaders during the ensuing fight. While drifting around the spot we came across a big tripletail laying on its side as it camouflaged itself amongst some flotsam and jetsam. It was doing so for good reason as a big marauding whaler came right up to it a couple of times, trying to decide whether it was food or not. That probably explained why it wasn't keen to break cover and snaffle Jim's minnow that he was twitching past its nose. Up here in tropical waters sharks are an ever present factor and none more so than around the Vernons where there are legendary populations of these men in grey and brown coats. Anyway, despite fish still marking on the sounder and the occasional strike, we decided to move on and try our luck elsewhere. As it was Jim and Jack's first time to the Vernons it was a good opportunity to show them the islands' unique blue holes. 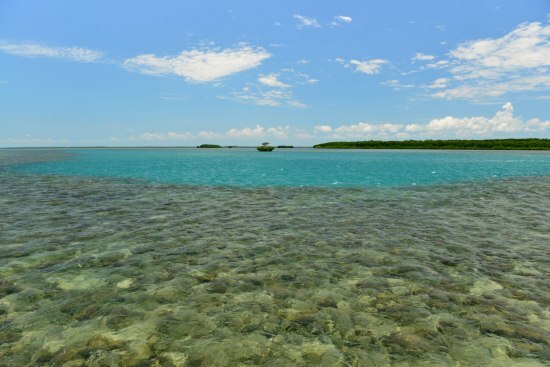 As their name suggests, these are deep holes located within the shallow fringing reef surrounding the islands, as well as Gunn Point itself which is the closest point from the mainland. The water in the holes is a striking blue/green colour and they hold lots of smaller reef fish and at times some good-sized GTs, queenies, barracuda and of course sharks. Often I take visitors here for the simple beauty of the place, as well as to have fun catching smaller fish on lures and fly. Young Jack Harnwell enjoying the sites of the Blue Holes around the Vernon Islands to the north-west of Darwin. After resting up for a spot of lunch in one of the holes, we then moved off into deeper water to find some macs to jig up. At the next spot we arrived to find plenty of queenies and the odd mac busting up small baitfish on the surface. The north-easterly sea-breeze was now in and along with plenty of tidal run both combined to make for some choppy conditions. Nonetheless, the queenies were on the chew and Diamond Jim was getting stuck into plenty of them. Jim hooked up to a mac on light spin gear. As can be evident from an unbent rod, loose line and the commotion towards the top of this photo... the sharks won this round. Laugh or cry... on this occasion Jim takes the former over the latter. 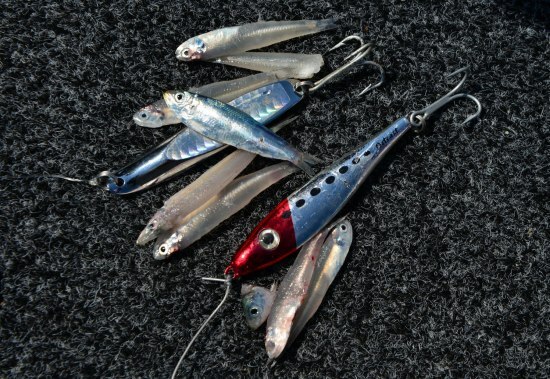 Here's the small baitfish that the macs and queenies were feeding on, as well as the Twisty and Outcast lures used to catch these predators on. On the sounder I could see macs holding on the up-current edge of the rise and before long they too were snaffling our jigs. However again running mono leaders meant we didn't stay connected for very long. Thus I put on a wire trace and a couple of drifts later my jig was smashed by a decent broad-bar mac not far from the side of the boat. The broad-bar took off in an arc towards the stern pulling drag as it went. I didn't think too much at the time and remained seated on the starboard transom as I started to apply some sideways rod pressure to bring it back around. A couple of seconds later from astern the mac exploded from the water about 6m metres away and was coming straight at me! In cricketing speak, when a fast delivery catches a batsman by surprise they say the ball got very big on him. Well that mac got bloody big on me! I clearly remember seeing it exiting the water, and my next image was seeing its head and big eye flashing six inches past my right cheek as I jerked my head to the left. Mark Taylor would have been proud of that leave! As I had swung my head inboard, in the same direction of the incoming kamikaze, I caught a glimpse of the still airborne mac as it flew over the top of my steering console and through the forest of vertically-mounted rods towards where Jim was standing on the other side. Luckily the mac just missed him but to my horror I saw it crash into Jack's shoulder and neck region knocking him over. I immediately thought the worst as mac teeth are like scalpels and any severe laceration around the neck area can have disastrous consequences. In seconds Jim and I were hovering around Jack to see if he had been injured. But despite the impact area being covered in mac slime, miraculously, Jack hadn't been cut open. Jack and Jim Harnwell holding up the airborne kamikaze mac that decided to shake things up for all aboard. Knowing Jack was fine we now turned our attention to Jim's upper right arm to which was pinned a 60g Halco Outcast jig - the same one I had hooked the fish on. On the way past, the flying mac had brushed Jim's fishing shirt, snagging the trebles on his sleeve and breaking off one hook shank which remained embedded in the fish's jaw. We didn't know that at the time so looking at the lure we could only see two shanks of the treble and assumed the third had dug in to Jim's arm. But it hadn't and Jim's only injury was a long graze and a torn sleeve of his beloved Fisho shirt. Jimbo was very quick to point out that his "guns of steel" (his biceps) had saved him yet again! Jim Harnwell showing where the flying mac decided to leave the lure as it brushed past him. According to Jim thankfully he was saved from any real damage by his biceps of steel! As an angler who has done a lot of mac fishing in Top End waters, hooked Spaniards or broad-bars jumping out the water to try and escape sharks happens just about every trip. Over the past seven years I've had numerous hooked macs jump over the boat and at least three land in the boat, including one which jumped in - with my lure still in its mouth - a good 10 seconds after another mac had freed it by cutting the leader some 80 feet down. However, the incident with Jim and Jack aboard a couple of days ago was the first time an airborne mac had struck someone aboard my boat and we were very lucky it didn't injure one of us. Stories of horrific injuries inflicted on seafarers by airborne macs are in no way nautical myths and are more common than you might think. My neighbour Gavin Dally, who manages the marine collection at the NT Museum, had a friend get hit in the back by a jumping mac while on her yacht. She was cut up badly and had to receive medical treatment. A postscript to this particular incident is that Gavin preserved the head of the mac which now sits on the victim's mantle piece. Her experience and the incident aboard Barraddiction a couple of days ago serves as a timely reminder to never take the sea and all her creatures for granted. And what of Jim's lofty pearls of wisdom on such matters? "Mate ... always keep your guns loaded - whether you're fishing on a boat or just posing in front of the mirror!"